Law enforcement officials block driveways to buildings in the Lennox industrial park. 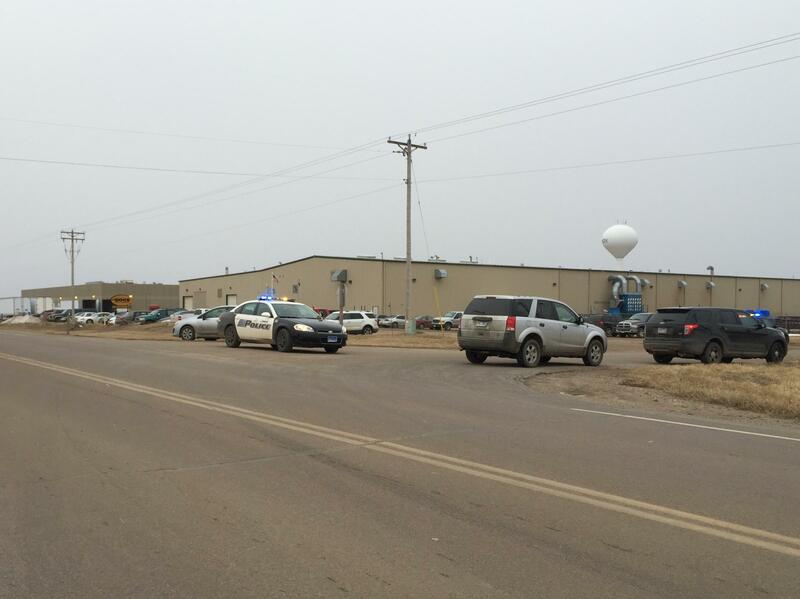 At least one person is dead in a shooting at a southeast South Dakota business. It happened Thursday afternoon in Lennox. Police are withholding the names of three people hurt in the shooting and the identity of a body found in a burned semi truck a few miles from town. At about 2 p.m. Thursday, the sole police officer on duty in Lennox responded to a call in the town’s industrial park. In the Pro-Tech building owned by Sioux Steel, law enforcement from several agencies found two people shot and a third physically assaulted by a gunman. A man was flown by helicopter to Sioux Falls. He died. A woman who was shot and another person hurt by the shooter are both in the hospital. "While we were investigating that, there was a fire that had gotten called in southwest of town," Lennox Chief of Police Orville Jorgensen says. "It was a semi-truck. That truck we believe is linked to this situation and is very likely the subject that may be the suspect in this. We do not know for sure. We don’t have an identity on him. "Jorgensen says police are waiting on forensic evidence to identify the man. Law enforcement officials found his body inside the truck. The Lennox Police Chief says investigators don’t know of a motive for the shooting. "If we can identify the burning truck as the definitive suspect in this, you know, that may take some time down the road very possibly before we come up with a motive and that kind of thing," Jorgensen says. As authorities covered the two locations, other businesses and schools in Lennox were put on lockdown. When officials determined they were safe, employees were allowed out of their buildings and children were released from school. Jorgensen says this is an active, ongoing investigation and DCI is processing evidence from multiple crime scenes. Listen to this story about a deadly shooting in Lennox.